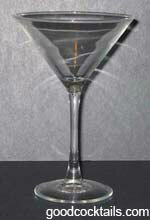 Rub the rim of a chilled martini glass with a lemon and dip it into cinnamon-sugar. Pour all ingredients into a shaker with ice. Shake and strain into the chilled martini glass.